Suzhou Marriott Hotel is located in the downtown area and intersection of the New & Hi-tech Development Zone, adjacent to Suzhou Government and Administrative Service Centre with easy access to highways and local attractions. 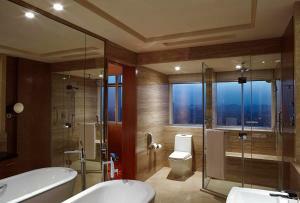 It offers a swimming pool, sauna and gymnasium. Mariott Suzhou Hotel is a 10-minute walk from Xihuan Subway Station and a 6-minute walk from Suzhou Government and Administrative Service Centre. 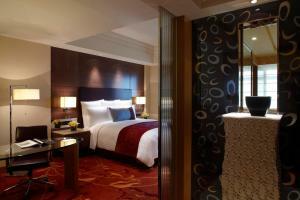 Lingering Garden, Hanshan Temple and Senso Mall are about 7 minutes' drive away. Shantang Street is 10 minutes' drive away while Tiger Hill and Guanqian Shopping Street are 13 minutes' car journey away. Guests can take a dip in the indoor swimming pool or keep their workouts at the fitness centre. For convenience, it also has car rental services and a 24-hour front desk. 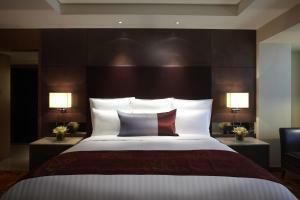 /Guests are required to show a valid government-issued ID card or passport upon check-in. Please note that the restaurant Asia Bistro is currenly closed due to renovation works. The breakfast buffet is moved to the VIP Centre on the 2nd floor and will move back to Asia Bistro from 28 January 2019. Dinner buffet will be available from 28 February 2019. 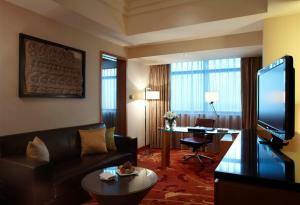 Offering city views, the room comes with plush beddings, ironing facilities, LCD TV and iPod docking station. Room offers Executive Lounge access. 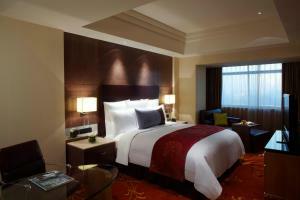 Rate: CNY 650.00 ... CNY 2533.20; select dates below to get current rates.